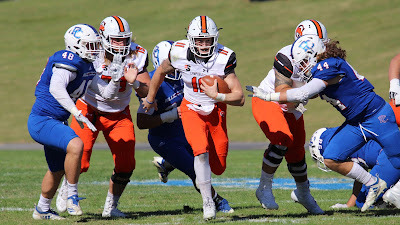 CLINTON, S.C. – Daniel Smith ran for three first-half scores, helping Campbell secure its first Big South Conference football win, downing Presbyterian on the road 34-6 Saturday at Bailey Memorial Stadium. Campbell (6-4, 1-3 Big South) notched back-to-back winning seasons for the first time in its modern history (since 2008) with the victory. In the program’s 11th season and first as a Big South member, the Camels earned their first win in the league, spending the program's first 10 seasons in the Pioneer Football League (2008-17). PC (2-7, 0-5 Big South) was limited to just 12 passing yards in the loss, a Campbell single-game record, and only 176 yards of total offense. The Blue Hose completed 4-of-20 passes with an interception through the air, while running for 164 yards and a touchdown. Campbell, meanwhile, piled up 446 total yards, including 337 rushing, led by Smith’s 129 on 11 tries. The redshirt sophomore posted touchdown runs of four, 51 and 45 yards, also completing 14-of-22 passes for 109 yards and another TD. Smith found the end zone on Campbell’s first two possessions, including a four-yard dive to the pylon to cap a seven-play march, and a 51-yard sprint to make it 13-0 after a blocked extra point. Jordan Morgan put PC on the board with a five-yard keeper, but Aaron Blockmon quieted the rally, returning the ensuing kickoff 88 yards for the touchdown. The kick return TD was the second of Blockmon's career and the redshirt senior’s first since his 2015 freshman season. The score tied Blockmon with Jonathon Rogers for the most kick return TDs in CU history. Smith added another 45-yard touchdown run before the break, giving Campbell a 27-6 halftime lead. Smith’s third quarter 36-yard touchdown pass to Caleb Snead on a fourth-and-six gave the game its final margin. Rocky Reid posted 76 yards rushing on 13 carries, while Darius Barnes added 72 yards on 12 tries. Snead tallied 55 yards receiving with a TD on five catches for the Camels. Deontae Henderson posted eight tackles, including three stops for loss to lead the Campbell defense, while Levi Wiggins totaled seven tackles. Damien Dozier also gather five tackles with two TFLs, and Aaron Covington notched an interception in the road win. Morgan paced PC with 78 yards rushing and a TD on 17 attempts, completing 3-of-11 passes for nine yards, while Zola Davis added 49 yards rushing. Colby Campbell notched a game-high 14 tackles for the Blue Hose, also forcing one of four Campbell fumbles. Trent Carrington recovered two fumbles, adding eight tackles for PC. Campbell will close out the season at home on November 17, hosting Charleston Southern.